What points to consider when buying the best k cup coffee machine? K-cup coffee makers are the best purchase for those who only drink 1-2 cups at a time. Buying a machine with a large container of coffee is just a waste of money for casual coffee drinkers and single people. Such people must go for coffee makers which are designed to meet their specific needs such as only one cup of coffee per brewing cycle. You know that a single cup of coffee from such machines is far better in taste and quality from a coffee from 10-12 cups brewer. In this article, we are going to discuss about few such coffee machines offered by different brands. 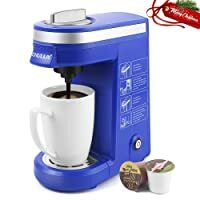 It will help you to make a right decision when you have features, pros and cons, and functions of various k cup coffee makers at one place. Just compare them and own the one that fits your preferences and budget. Looking for quality, durable, elegant, functional and reasonably priced k-cup coffee maker for office use under $200? 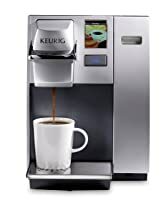 Here, your search ends with Keurig K155 that comes with numerous features and is perfect for small to medium size offices. It is the best way to engage employees and to make a stylish impression in the office. The perfect cup of coffee, hot cocoa or iced beverage can be enjoyed by simply touching a button. The brew temperature setting is available that brew a coffee of your taste within just a minute. It also has an Auto on/off, removable drip tray, four cup-size options, clock time, LCD touch screen and others. 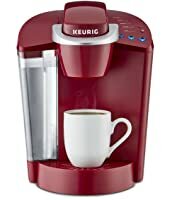 The features and functionality of this outstanding k-cup coffee machine by Keurig makes it one of the best choice to have a cup of coffee of your taste at such an affordable price. 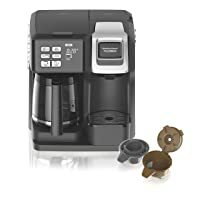 The exclusive feature that cannot be difficult to find in other k-cup coffee makers under $200 is the removable internal water tank, which allows users to drain and remove water while transporting or storage. You can even choose your preferred language – English, Spanish or French. No worries, if you do have enough money to own an expensive coffee maker with innovative features. Keurig K155 coffee machine offers valuable features that impress everyone. The buyers looking to have long-term investment must sure think of Keurig K155 Office Pro Single Cup coffee maker at least once. Hamilton Beach 49976 allows you to make a single cup of coffee and even a pot of coffee for your whole family or a group of friends. It takes only 10 minutes to brew a full pot. It takes care of the different types and quantities of coffee lovers. Both fresh grounds and K-Cup packs can be used as per the choice. It is a 2-in-1 coffee maker under $100. It is designed to give maximum flexibility to its users. One portion brews up to 12-cups carafe with programmable timer, pause and auto shutoff features. On the right side, you can make one full cup with bold or regular brew strength options. The additional features include a storage area at the cup stand to keep single-serve packs, easy to fill water reservoirs, and removable drip tray. Keurig K55 K-Classic has earned praises for its ease of use, intuitive controls, and durability. It can be the best choice available under $100. It can be used to make a variety of coffees, tea and other hot drinks. 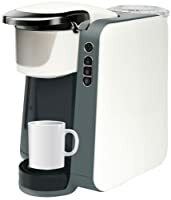 It comes with 4 K-Cup pods, 2 water filters, removable 48-ounce water reservoir, easy-to-use button controls, removable drip tray, and auto-off feature. The large water tank allows you to brew 6+ cups before refilling it. Just choose the brew size to have the beverage as per your taste. The morning routine can be simplified by just inserting a pod and selecting a brew size. The great-tasting cup will be ready to enjoy in a minute. So, if you cannot start your day without a hot cup of coffee then you must have this sleek and attractive coffee maker in your kitchen. Single Cup Brewer by Mixpresso is another coffee maker with numerous outstanding features and functions available under $100. This reasonably priced machine makes tasteful coffee in only a minute. It has programmable auto shut off feature that gives safety after brewing. It has a stylish design that adds elegance to your kitchen. It is a great purchase in all ways. The features such as 45 floz water reservoir, LED light indicator, automatic shut off, 3 cup-sizes brew options, and removable drip tray, enable you to get a perfect brewed coffee in the morning. With only one touch button, CHULUX Coffee Maker allows you to easily brew your favorite coffee. Simply add a pod and push the button. It ensures to meet the efficiency, reliability and affordability of the machine that every buyer looks for under $50. It can be bought in five different interesting colors. The features such as removable drip tray, 12 ounce water reservoir and easy to clean allows having a great-tasting coffee of your choice in an easy and simple way. Due to its compact design, it takes very little counter space. It can also be good gift selection. As many different brands and models are available in the market, so choosing one can be a difficult task for many people. No doubt, existing k cup coffee makers can attract anyone, but you cannot own any machine without analyzing its reviews and offered services. Below given points will help you to find the best k cup maker for commercial or home use. Hundreds of models are in the race to win the hearts of the people who want to own a machine that ensures to give them a tasteful cup of coffee every time they use it. Never go with any brand or model without making a proper research regarding its feedbacks, reviews, reputation, and reliability. You do not need to visit a store to store for the inquiries. All related information can be easily obtained online with better decision-making ideas. There is no doubt that all k cup coffee machines are fully capable of making coffee faster for any person’s taste. Just sticking to one main function, while buying a machine, is not a good decision for a buyer. Additional features must be noticed to own a quality and best coffee maker to avoid waiting for the minutes for the first morning cup. Make sure to select the one that gives everything to enjoy the maximum convenience of using it. The number of models with different features comes in various price ranges. So, choosing one can be somewhat confusing for you. Just finalize your budget or maximum price range which you can easily afford. Buying a machine out of your budget is not a good deal at all. Analyze the features, quality and trusted name of different coffee makers available in your price range. Pick the one that best fits your every need. It varies from person to person as well as where you are going to use your single cup coffee maker – household or office. Some people find it hard to understand digital controls with many options. Make sure to go through the customer reviews regarding any kind of issues with its use, loading or cleaning. Find the user-friendly machine to have a cup of coffee to satisfy every taste. To have the real convenience of a coffee machine, you must check the capacity of the water tank. If you are looking for a home use with 3-5 persons, water reservoir of 40oz or 50oz is enough for you. For office with many employees, it is recommended to have a machine with ample of tank capacity. It means refilling the machine requires less time with a large tank. Let’s go through the reviews of few k cup coffee machines which are considered as the best choices to meet the varied needs of buyers. All these k cup coffee makers are suitable for home or office use. But, you do not need to miss comparing their features and price to select the one that best fits your needs and preferences. They are tough to beat one another. If confused, just compare the reviews, customer feedbacks, manufacturer reputation, as well as the related services. Make sure to buy the best machine within your easy to afford budget. When we talk about the above discussed best review, Hamilton Beach 49976 Flex brew coffee maker leads the competition. You must also do your homework to find the best single cup coffee machine in order to get the best value for your money. This article will definitely help you in finalizing the best deal. This article was written by Top C.M. CoffeeMakerSavvy.com is participating in the Amazon Services LLC Associates Program, an affiliate advertising program designed to provide a means for sites to earn advertising fees by advertising and linking to amazon.com. The Amazon Services LLC Associates Program is the leading selling program on the Internet, with hundreds of thousands of members.